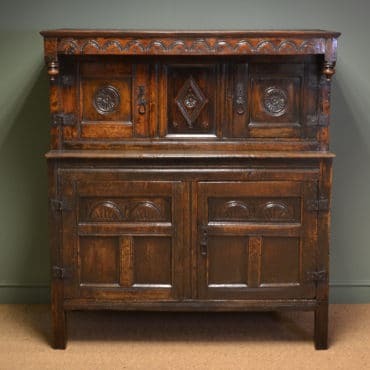 In the 17th century the English side cabinet on stand appeared, fitted with several drawers, cupboards and secret compartments enclosed by a pair of panelled decorated with marquetry inlay was fashionable. 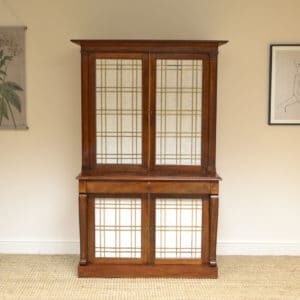 The 18th century furniture designers created the Mahogany ‘china display cabinet’ to show the fine oriental porcelain, frequently decorated in the chinoiserie style to match the items within. By the mid 19th century the ownership of porcelain items was no longer just for the very rich, now far more people aspired to the possession of things worthy of display and several new ceramics factories both at home and abroad worked to satisfy this growing appetite. 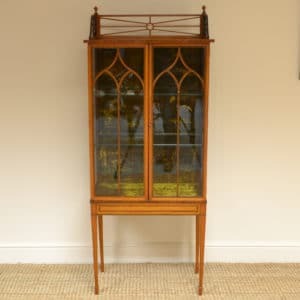 The result was an explosion of designs for antique display cabinets, some dripping with ormolu; some richly inlaid in fine woods or cut brass, others in the style of Sheraton and Adam and wall hanging. 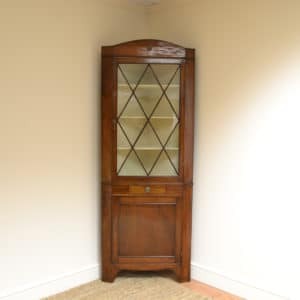 More country antique cupboards were produced in the Victorian period in simple designs like the Oak Arts & Crafts house keepers or the harness design some polished and occasionally painted. 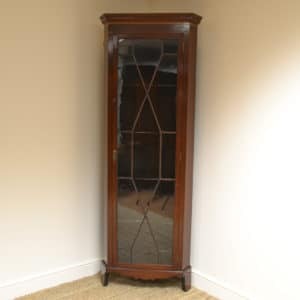 The Edwardian era was a time of new design in Antique Furniture with pieces being made to store sheet music designed by renowned makers such as Maple and Co to matching pairs of Bedside Cabinets, in beautifully figured walnut with fitted marble and French Art Nouveau influences. 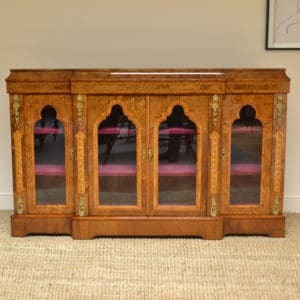 Below are a few examples of antique cabinets that we have sold, if any particular style looks of interest, let us know and we can try to find you something similar.Magnificent Quality Late 19th Century Satinwood Antique Side Cabinet. 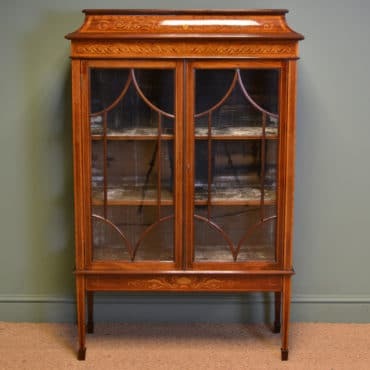 This fine quality antique satinwood cabinet dates from the late 19th century, circa 1890 and displays fabulous kingwood and ebony inlay decoration. 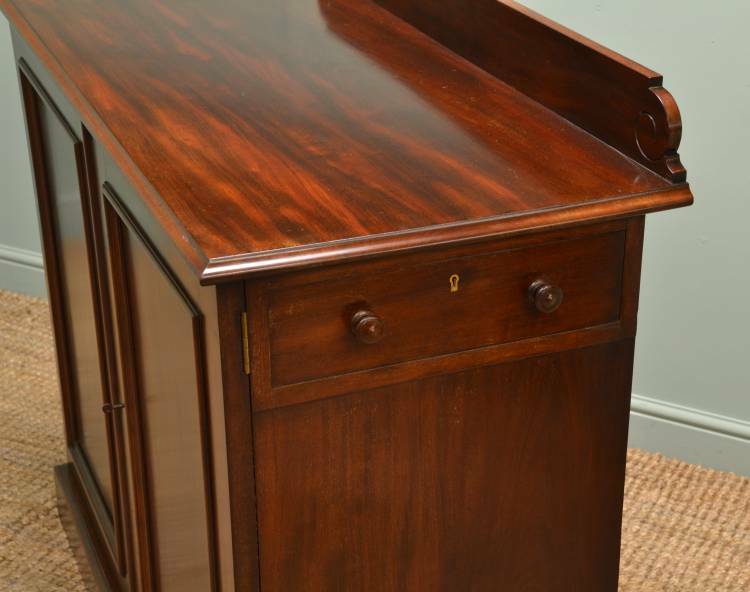 It has a beautifully figured rectangular top above two cupboard doors with key and working lock. The doors have a wonderful brass fretwork front with pleated material backing, very ‘Regency’ in style. The doors are flanked by reeded turned columns with Corinthian designed capitals. The interior of the cabinet has a fixed shelf and the whole piece stands on shaped bracket feet. 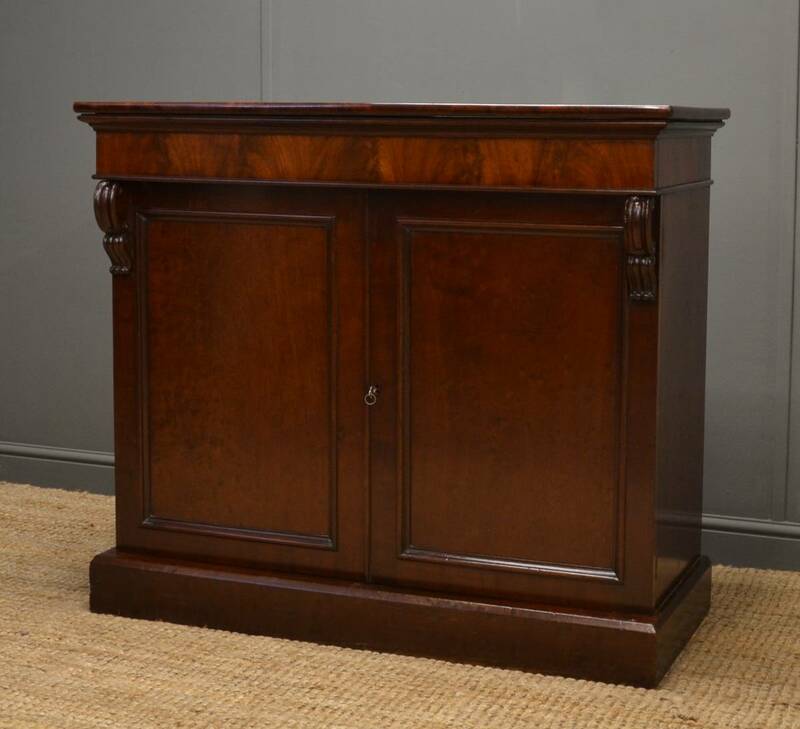 This delightful cabinet / small chiffonier, is a wonderful example of a quality late 19th century piece built in the Regency style. 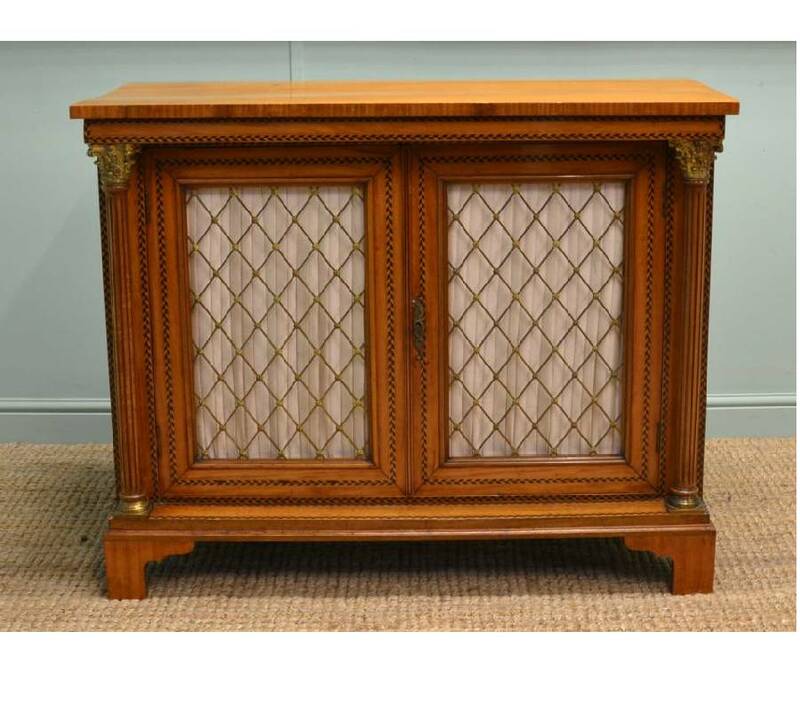 It displays fabulous herringbone and kingwood inlay around all the edges and, along with brass detailing, it compliments the golden shade of satinwood perfectly. 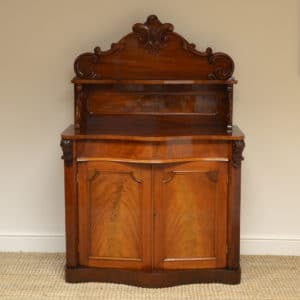 Victorian Mahogany Antique Cupboard / Side Server. 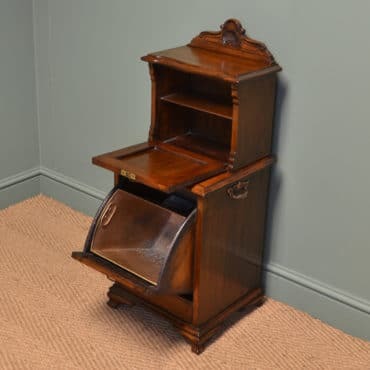 This unusual antique cupboard / side server dates from around 1870 in the Victorian period and is constructed from mahogany. 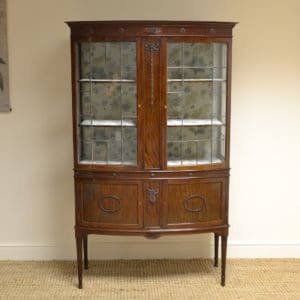 It has a decorative scrolled upright back with a beautifully figured rectangular moulded top above two cupboard doors with moulded edges and key with working lock. The interior has a fixed shelf and a single drawer. 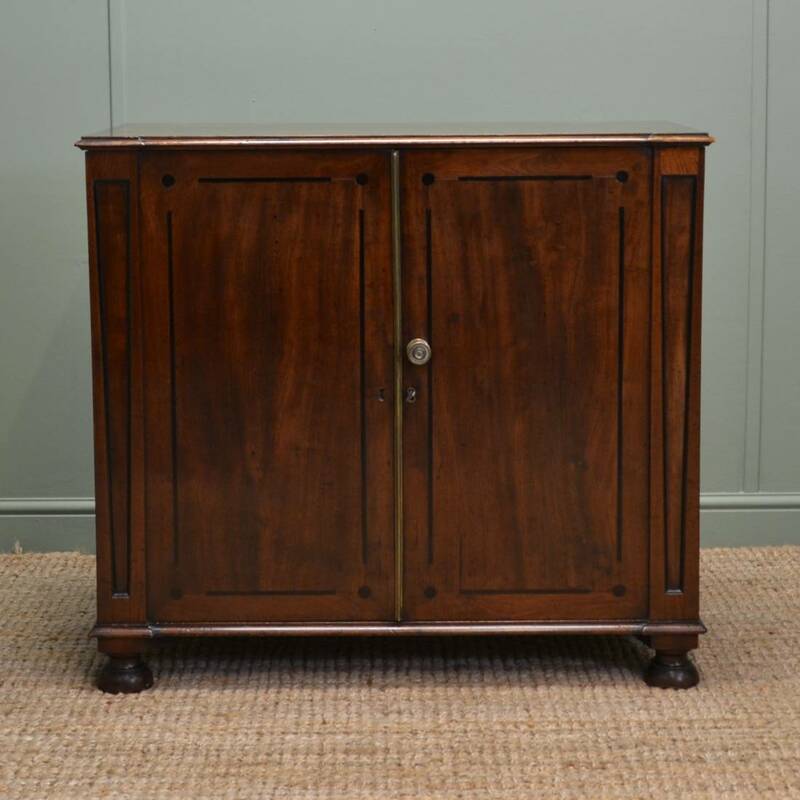 This cabinet is very unusual, probably a specially commissioned piece, to the right side can be found another drawer with turned handles and hardwood lining. This drawer benefits from a sliding server top, making it ideal for use in a dining room. 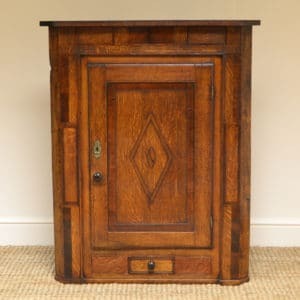 Small Victorian Figured Walnut Antique Cupboard. 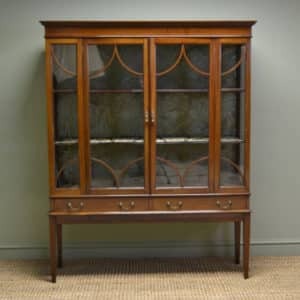 Dating from around 1880 in the Victorian period this continental antique cupboard is constructed from beautifully figured walnut. It has a rectangular moulded top above two stunningly figured cupboard doors with moulded edges and a key with working lock. The doors are framed with reeded sides and scrolled corbels. 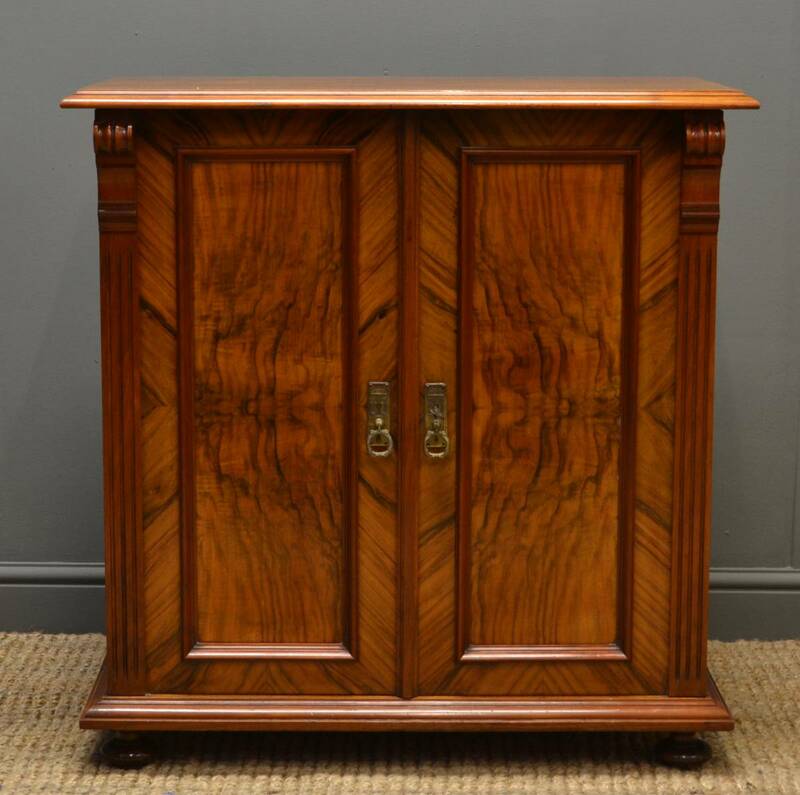 Quality Victorian Walnut Antique CupboardHeavily influenced by the start of the Art Nouveau movement this quality Victorian walnut antique cupboard dates from around 1890. 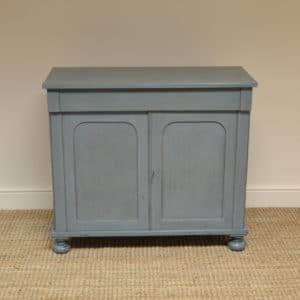 It has a rectangular top above two drawers with moulded edges and original Art Nouveau handles. The two cupboard doors each have three raised fielded panels, one of which on each door displays lovely carved detailing. The doors have the original Art Nouveau handles and come complete with key and working lock. 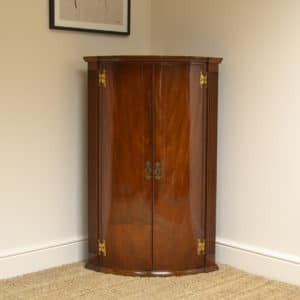 The cupboard stands on a plain plinth and is finished with reeded side front edges. 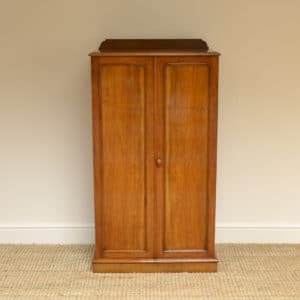 Quality, Regency, Rare, Plum Pudding Mahogany, Antique Cupboard. 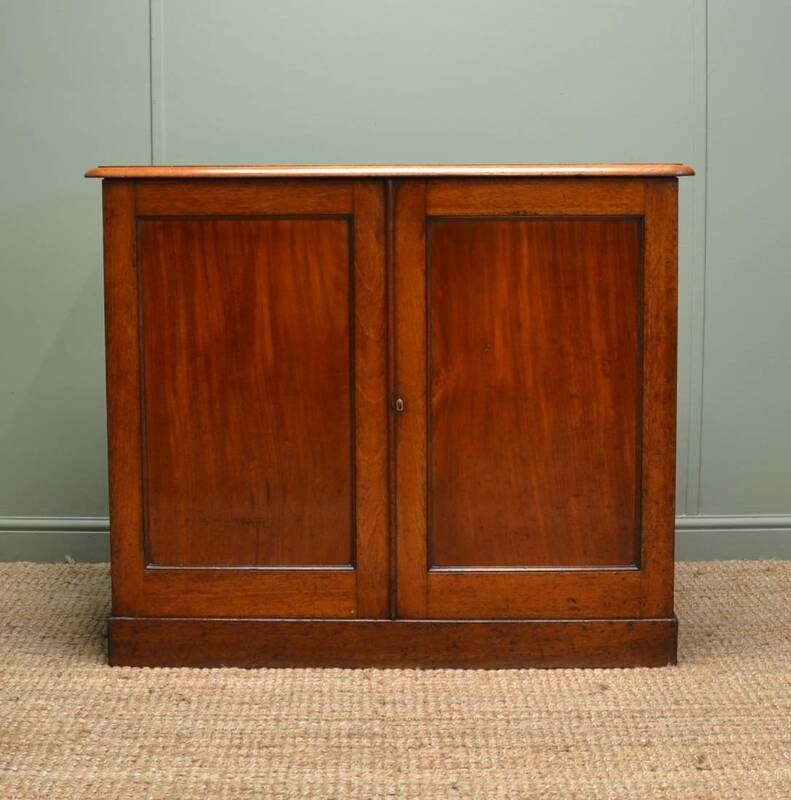 Dating from around 1830 this quality Regency antique cupboard is made from rare plum pudding mahogany. 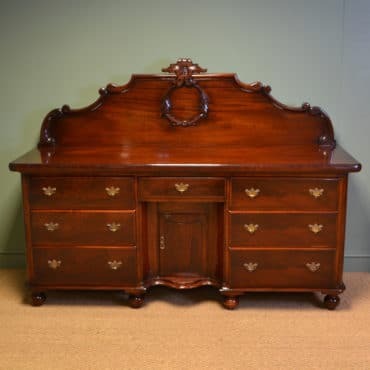 The rectangular top has a flamed mahogany half round moulded edge above a striking flamed mahogany frieze drawer. 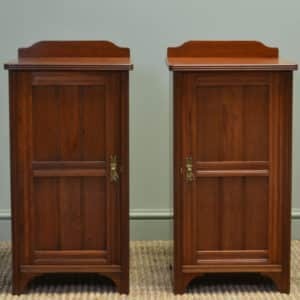 Two elegantly scrolled corbels flank two cupboard doors each having wonderfully figured plum pudding mahogany panels. The doors have a key with working lock while the interior has two adjustable shelves. The piece stands on a plain plinth and oozes quality, the fine carving and best quality timbers used are signs of a true craftsman. 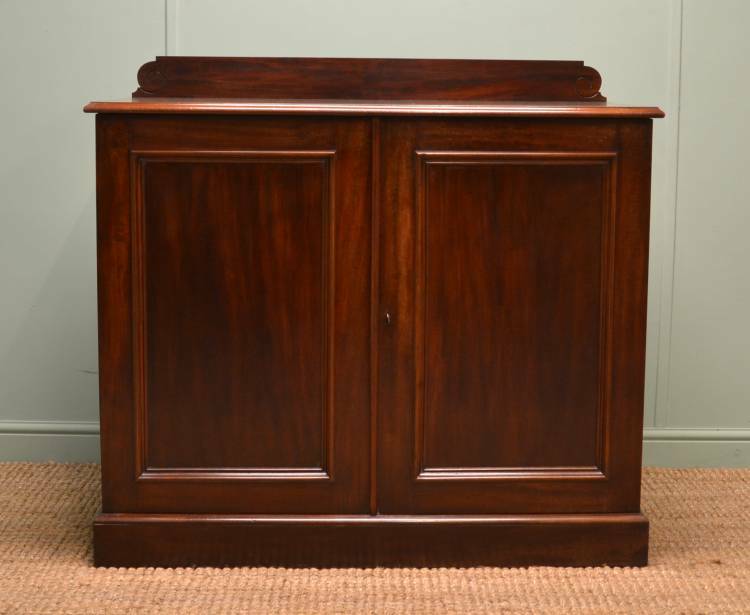 Superb Quality Small Regency Mahogany Antique Cabinet. 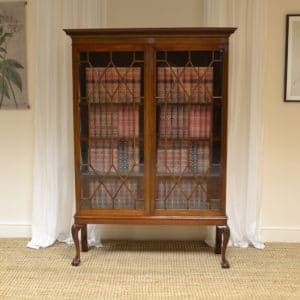 This delightful antique Regency cabinet, circa 1830, is of superb quality and made from mahogany. 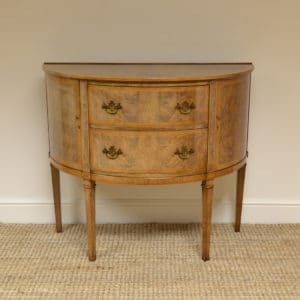 It shows superb attention to detail from the cabinet maker both in its style and construction, such craftsmanship is very rarely seen today and when it is found, it is usually in a bespoke piece of furniture that is justifiably priced accordingly! This cabinet has a slight inverted break fronted moulded top above two cupboard doors with simple and stylish ebony inlay decoration. There is a single brass handle and brass clash mould along with key and working lock. Flanking the doors the sides display a geometric carved indentation again simple and stylish in design. The interior of the cabinet has a single adjustable shelf . The piece stands on an inverted break fronted plinth above half turned bun feet. 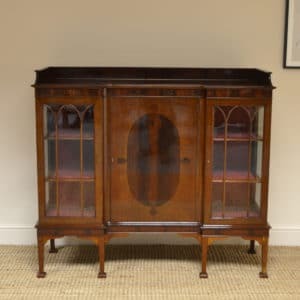 This fine quality Regency cabinet has delightful small proportions making it very desirable and practical for the modern home. 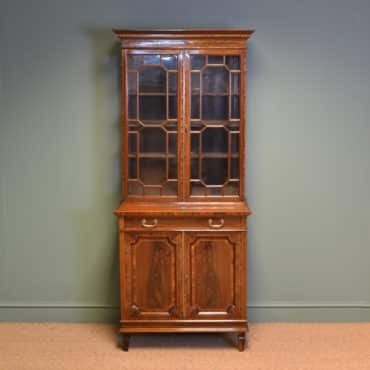 Dating from around 1880 in the Victorian period this satin birch antique cupboard is in a rather attractive, unusual design. 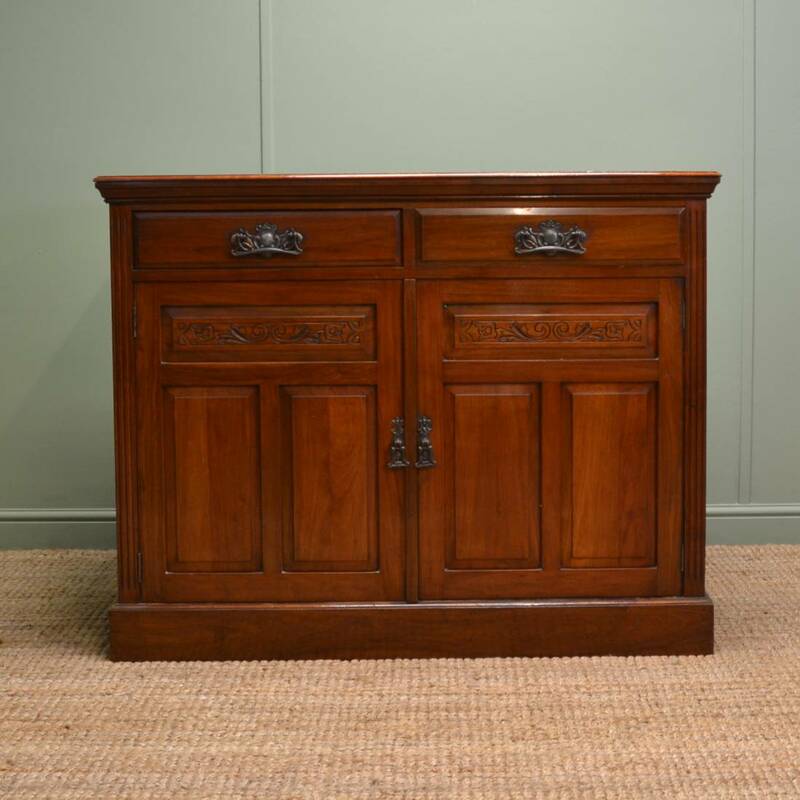 It has a rectangular top with moulded edge above two drawers that still display the original brass Arts & Crafts style handles. The two cupboard doors are panelled, have beautiful figuring and retain the original brass handle along with key and working lock. The interior of the cupboard has two removable shelves while the piece as a whole stands on a plain moulded plinth with rounded corners. 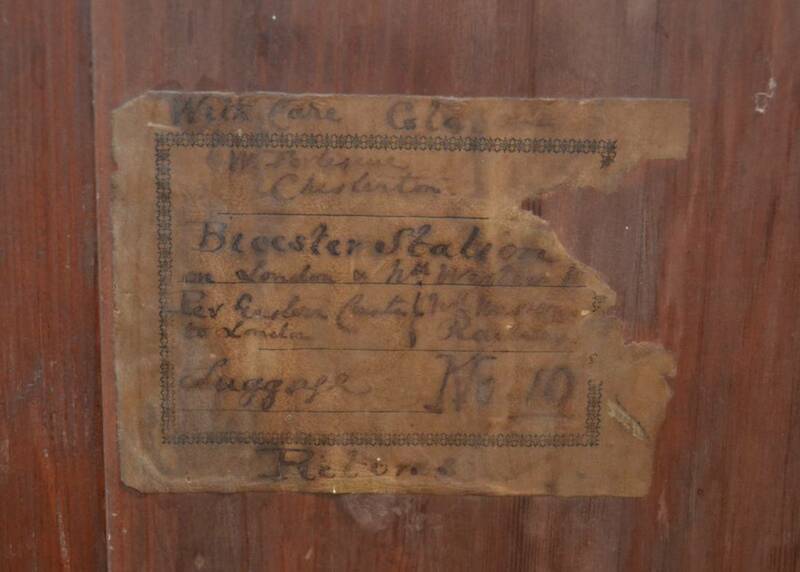 The sides are also panelled while the back still boasts its original boards! 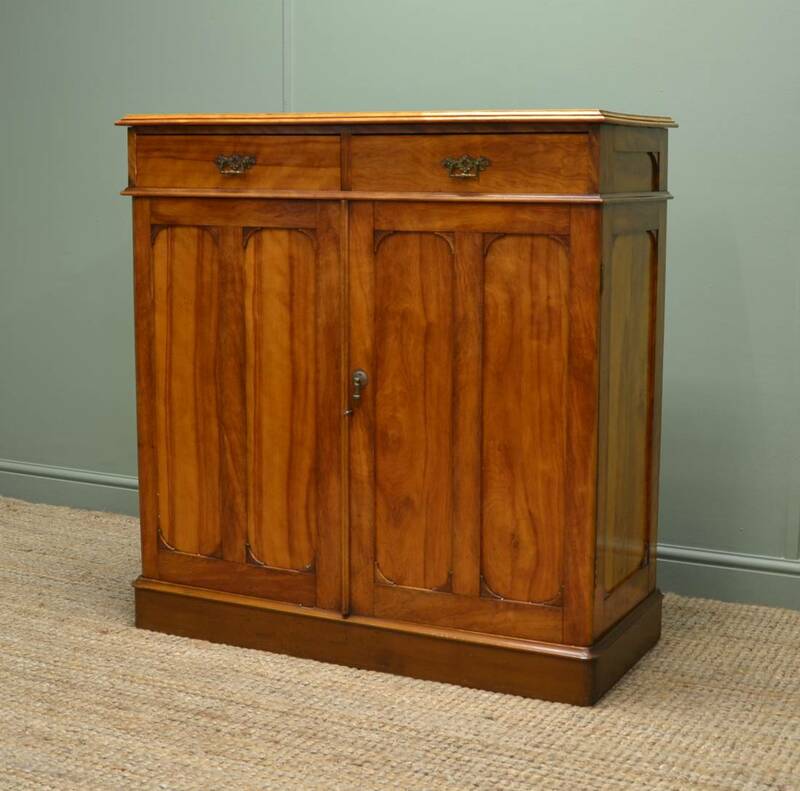 This very practical antique mahogany Victorian cupboard, circa 1860, provides an elegant and practical storage solution for any living space. 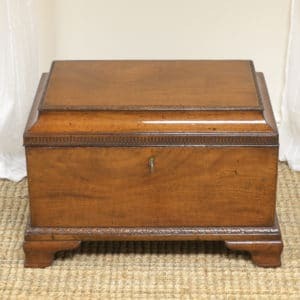 It has a rectangular moulded top with rounded corners above two beautifully figured doors having moulded edges, key and working lock. The interior has a single removable shelf while the piece as a whole stands on a plain plinth and still retains the original back boards.